Ladies and gentlemen, hang on to your hearts; the cast of Love's Labour's Lost is here to steal them all away. First up, with the deftest of thieving hands, is Alice Qin. This Australian-raised actress is sure to get your budgie smuggler in a twist. (Are we using that phrase right?) Get ready to give it up for Alice! If that's a budgie, consider us smuggled. HID: Alright, Alice. First thing's always first: What’s Rosaline’s favorite color and why? AQ: She's not a child, she does not have a favourite colour. She does, however, look good in jewel tones. She also shakes her head at you for asking. HID: Yikes. Sorry to offend, ma'am. Um...okay, if Rosaline and Berowne really did dance together at Brabant once, what kind of dancing did they do? And how’d the rest of the evening go? AQ: You know how sometimes when you're doing your thing on the dance floor and some dude just comes up behind you and grinds on you? You're kind of feeling the guy so you want to keep it going a little bit but he is doing this awkward knees-bent-two-step thing and you want to maintain contact so you just move along with him until your quads burn with the fire of a thousand sexual frustrations? That happened. Then they made out, but she left before they could exchange digits. HID: Awkward. If Rosaline were to be sorted into one of the houses of Hogwarts, which would it be, and why? AQ: Ravenclaw. Although she would gladly go to war beside the Princess if it was asked of her, so there's some loyalty and bravery there, but she's too smart to choose Gryffindor. HID: Rosaline seems to have a lot of fun torturing Berowne. What do you think would be her favorite torturous tactics to win his affection? Anyway, anything else we should know about you or the show itself? AQ: A lot of my actions are just Cher Horowitz saying "As if!". Looks like the acting secrets are out of the bag. 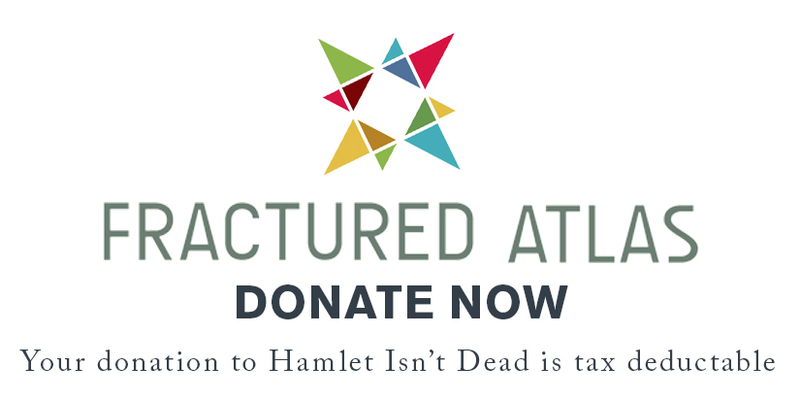 But don't worry, the show has plenty of surprises in store, and there are more heartthrobs a-coming in Hamlet Isn't Dead's "Struts & Frets" series. Tune in tomorrow for Alice's on-stage opposite, Berowne!